MANILA, Philippines — The Philippines and Japan on Monday signed two loan deals worth P98.7 billion for two projects that seek to improve flood control management in Metro Manila and integrate a three-way commuter rail system. Finance Secretary Carlos Dominguez III and Japan International Cooperation Agency director-general Shigenori Ogawa sealed the agreement providing the Philippines with a P80.47-billion loan (about $1.54 billion), which represents the first tranche of Japan’s total commitment in providing funding support for the North-South Commuter Railway Extension Project. The loan deal for the railway project carries an interest rate of 0.1 percent per annum for non-consulting services and 0.01 percent per annum for consulting services. The loan is repayable within 40 years, inclusive of a 12-year grace period. Dominguez and Ogawa also inked the P18.22-billion loan accord (about $351.8 million) for the fourth phase of the Pasig-Marikina River Channel Improvement Project. JICA’s loan for the flood control project also carries the same concessional lending terms given for the NSCR Railway project. 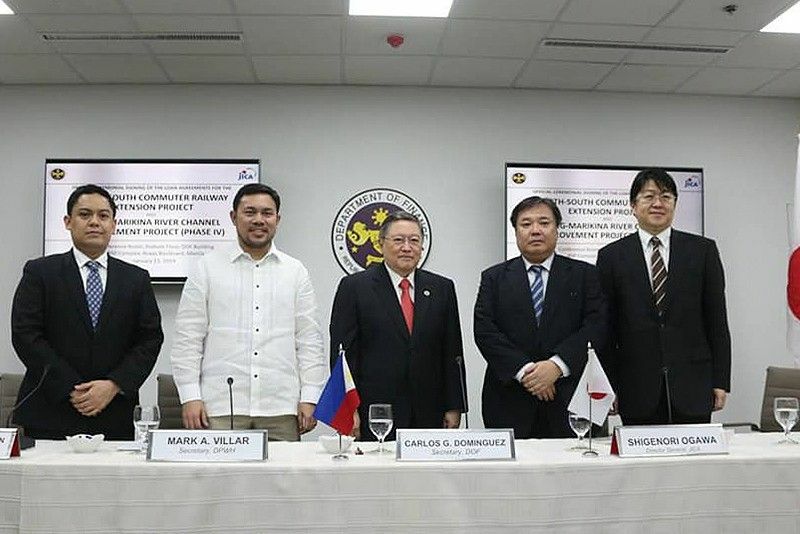 “This is, by far, the fastest loan processing time in the history of Philippines-Japan bilateral cooperation. We would like to share the credit here with our counterparties, who espoused the same sense of urgency and trusted our commitment to get these projects done,” Dominguez said. The NSCR Extension Project forms part of the 147-kilometer NSCR System of the Philippine National Railways. With a total cost of P628.42 billion (about $12.03 billion), the high-capacity commuter railway system is the biggest combined project so far to be undertaken under President Rodrigo Duterte's “Build, Build, Build" program. Meanwhile, the fourth phase of the flood control project involves the implementation of channel improvement works along the stretch of the Upper Marikina River—from the Manggahan Floodway to the Marikina Bridge—and the construction of the Marikina Control Gate Structure plus two floodgates in Cainta and Taytay, Rizal utilizing Japan's disaster prevention technology.